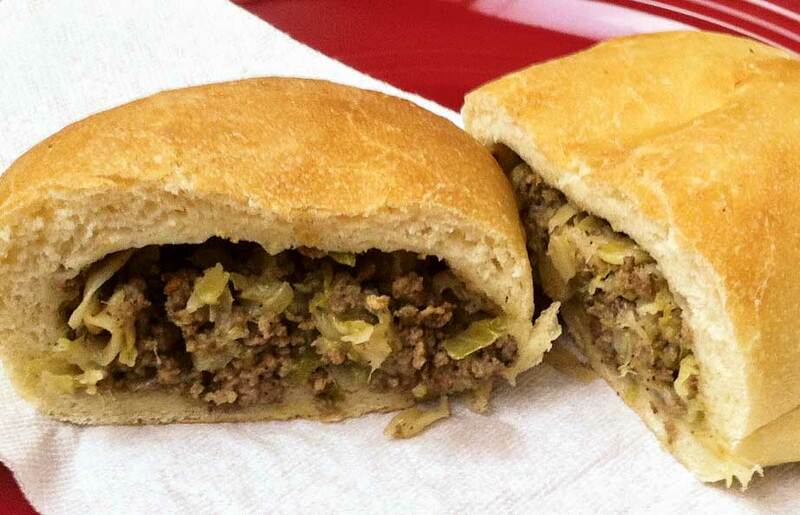 Kraut burgers (also known as Bierocks) which are the bomb! All I heard when I first sampled these yummy, delicious, mouthwatering delights was the word burger – not the kraut part – ha. My friends Judi and Kay both make them for their families and each calls them something different. There are a couple of restaurants in Colorado that make them too. I recently bought some from Lauer Krauts in Brighton Colorado for a book club event, even Guy Fieri of triple D has visited Lauer Krauts. The leftovers are wonderful for breakfast too, just add a little grape jelly – yum. Cheers to the Bierocks and enjoy! The Kraut Burger recipe below comes from my friend Kim and the Taste of Home magazine. Bread –you can also use Rhodes dough, it’s found in your grocery’s freezer isle. I am totally going to use that, both my friends Judi and Kay say it works great. But if you are a bread maker go ahead and make the dough as outlined below. 1. Place 1-3/4 cups flour, sugar, yeast and salt in a large bowl. Heat the milk, water and shortening to 120°-130°. Pour over flour mixture; add the eggs. Beat with an electric mixer on low speed until blended. Beat 3 additional minutes on high. Stir in the remaining flour; knead until smooth and elastic, 6-8 minutes. 2. Place dough in a greased bowl; cover and let rise in a warm place until doubled, about 1 hour. 3. Meanwhile, in a large skillet, cook beef and onions over medium heat until meat is no longer pink; drain. Add the cabbage, seasoned salt, garlic powder and pepper; cook until cabbage is wilted. 4. Punch dough down; divide into 12 portions and cover with plastic wrap. Working with one piece at a time, roll into a 6-in. square. Place 3/4 cup meat mixture in the center of each square. Fold dough over filling, forming a rectangle. Pinch edges tightly to seal and place on greased baking sheets. 5 Bake at 350° for 18-20 minutes or until golden brown. Serve hot. Yield: 12 servings.